Litigation: Donate silver farsha to lord Ganesha on Wednesday or Ganesha Chaturthi if you are suffering with litigation. If you do not have money then prepares farsha through pomegranate twig on bhojpatra and offers it Ganesha. Marital Life: Do turmeric, sandalwood and saffron tilak to Ganesha for happiness in marital life. Then, chant “Om Gum Ganpataye Namah”. 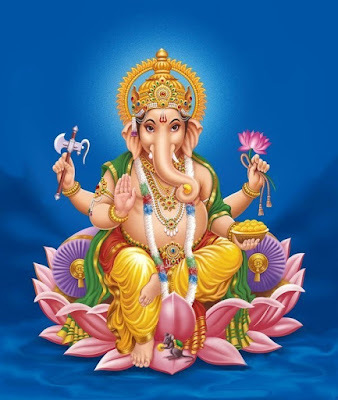 Rahu-Ketu: Dhumravarni Ganesha is very beneficial. Take seven grains with honey and yogurt. Prepare Ganesha image with this mixture. Cover the Ganesha image in cow’s gobar upla. Chant “Om Gum Ganpataye Namah” for 1008 times. When Rahu and Ketu creates problem in life then worship Dhumravarni Ganesha. Concentration: Many children face depression outside the home. In this case, crystal Ganesha and chant psalm for 1008 times. Give it to the child. Light lamp in the home in morning-evening. Study: Many students get playful mind. They cannot stay on one subject for long time. It is necessary to control on this condition otherwise; one may face many problems in life. In this case, chant “Om Vigneshwaraya Namah”. Also, worship crystal Ganesha. Cover Ganesha throat with yarn janeu. You can start this worship on Ganesha Chaturthi. Do not keep playful mind while chanting psalm. Fame: Chant “Om Gum Ganpataye Namah” in front of firoza Ganesha. Chant Ganesha atharvsirsh on Ganesha Chaturthi. Auspicious Work: Prepare 108 modak on Ganesha Chaturthi for 11 months. Family members should do havan and offer the modak in it. Disease: Many time people remain sick. They do not know the reason. They spend too much money on it. In this case, offer janeu to lord Ganesha. Worship lord Ganesha for 11 days. You can wear this janeu after worship.